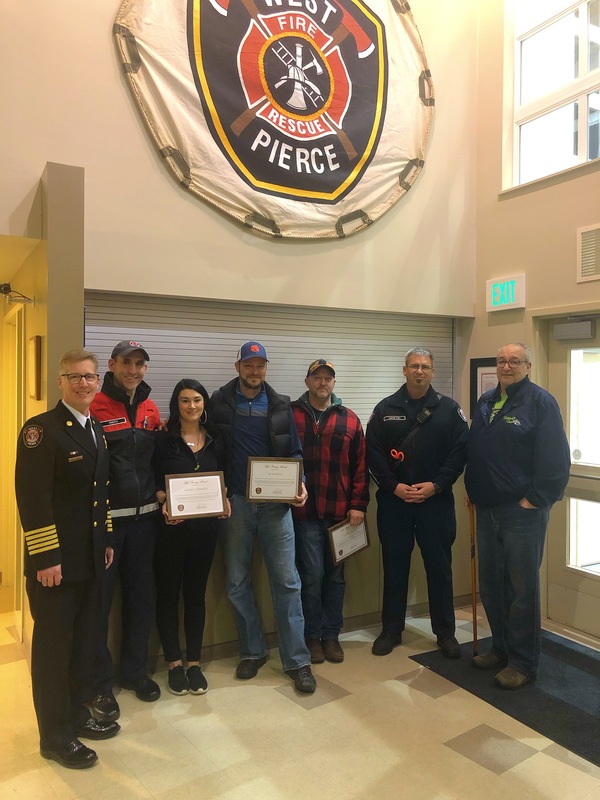 At Tuesday evening’s Board of Fire Commissioners meeting, West Pierce Fire & Rescue had the pleasure of awarding three community members with Life Saving awards for their selfless acts in saving a man’s life following a cardiac arrest. In the audience was the patient, Lyle, who stood next to Chief Sharp as the awards were given. On September 9 at Burs Restaurant, firefighters were called to reports of an unconscious man in the parking lot. These three individuals called 911 and initiated CPR. After the first crew arrived, they continued doing chest compressions so paramedics could secure the patient’s airway and do all of the necessary tasks of an incident such as this. “They did such a fantastic job that by the time additional crews arrived, Lyle’s heart was already working appropriately again,” Chief Sharp said as he recapped the series of events. We are so proud of their efforts and dedication to helping others. Without their quick actions, it is unlikely Lyle’s story would have ended in the same way. Congratulations, JR, Jordan and David and thank you for your heroic work!